Buckingham Churches: Trinity Presbyterian Church | slate river ramblings . . . .
One of the nineteen Buckingham County churches mentioned in Thomas Baldwin’s Gazetteer of the United States (1854) is Trinity Presbyterian Church. 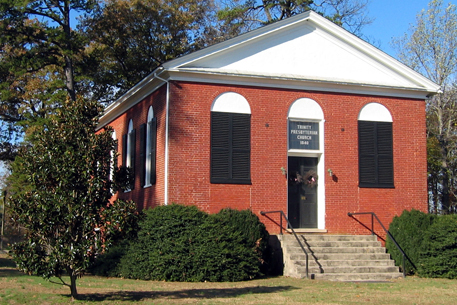 Unlike many of the structures surveyed in the 1930s for the Virginia Historical Inventory, Trinity not only survived the 20th century but is still maintained today. Two of the “many others” in the congregation were my ancestors John M. Harris (1785-1874) and his second wife and the mother of all of his children, Evelina Ann Moseley (d. 1841). Evelina Ann had many family members who lived near Buckingham Court House and attended Maysville Presbyterian Church. Note: Use the search function in the right hand panel to locate previous posts about the nineteen churches active in Buckingham County in 1854. Update: Other church members include: Holman and Cocke. One of the most influential members of the community who worshiped here was Mrs. Louisa Cocke of “Bremo,” Fluvanna County. She was the wife of Gen. John Hartwell Cocke, noted reformer and one of the Founders of the University of Virginia (his portrait hangs at The White House). Her Sunday school teacher at Trinity Presbyterian Church was Capt. George Holman of “Spring Garden.” He had married Mrs. Polly Jordan Payne Cocke. She was a second cousin to Mrs. Dolley Payne Todd Madison, wife of President Madison. The Holmans were supposedly buried at Trinity. Their son was buried at Trinity in a marked grave. He was Dr.George Payne Holman who died at “Edgewood,” Bremo Bluff, Virginia, in 1891, aged eighty-one–a physician for many, many years in Christiansburg, Virginia. Yes and we may hear more about Mrs. Louisa Cocke of “Bremo” in posts to come! I was at Trinity yesterday. George Payne Holman, MD is indeed there with a stone but no dates. His son, Judge William Henry Holman, his wife and all of his children are also buried there. It looks almost exactly like the Courthouse at Palmyra, Fluvanna. Interestingly, the Fluvanna County Courthouse was built at about the same time and its construction was supervised by a minister.